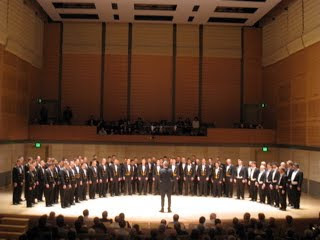 March: Chanticleer meets the US Naval Academy Men's Glee Club! A memorable evening in San Francisco at the Conservatory Hall. Our audience noted upon arriving that there were three rows of uniformed young men in the back of the hall. They didn't suspect until after our concert that it was the US Naval Academy Men's Glee Club and that they would sing Franz Biebl's Ave Maria with us. You can imagine the response! Actually you don't have to - we'll have video next week.